Kulinkovich cyclopropanation refers to the reaction of esters, amides, and other carboxylic acid derivatives with Grignard reagents containing β-hydrogens in the presence of a catalytic or stoichiometric amount of a titanium(IV) alkoxide reagent. Its products are cyclopropanols derived from the carbonyl carbon and the α- and β-carbons of the Grignard reagent. A titanacyclopropane intermediate is common to all Kulinkovich-type cyclopropanations. The combination of a Grignard reagent containing at least one β-hydrogen and titanium(IV) isopropoxide produces an intermediate titanacyclopropane that reacts with esters, amides, nitriles, and other compounds of similar oxidation state to afford cyclopropanes. The original Kulinkovich reaction discovered in 1989 employed esters and ethyl Grignard and yielded mono- or disubstituted cyclopropanols (Eq. 1). Since Kulinkovich's seminal discovery, the scope of the reaction has been extended to include a variety of carboxylic acid derivatives, including amides, nitriles, and carbonates. Additionally, an olefin exchange process introduced in 1993 has enlarged the scope of possible products to include more highly substituted cyclopropanols. In all of these reactions, a titanacyclopropane intermediate derived from one or two equivalents of the Grignard reagent and titanium(IV) alkoxide is implicated. Despite some operational difficulties associated with the need to slowly introduce the Grignard reagent, the Kulinkovich reaction employs readily available reagents and provides access to synthetically useful cyclopropanols. In addition, the reaction may be carried out in the presence of either a full equivalent or substoichiometric amount of titanium reagent, and the titanium reagent may be varied somewhat to optimize yields. The mechanism of the prototypical Kulinkovich cyclopropanation begins with the displacement of alkoxides on titanium by two equivalents of Grignard reagent to form intermediate I. Through a somewhat unclear mechanism that involves elimination of a β-hydrogen, one equivalent of alkane derived from the Grignard reagent is produced along with key intermediate II. This intermediate may be depicted using either the titanacyclopropane resonance structure IIa or the titanium(II)-olefin structure IIb. Crystallographic evidence indicates a carbon-carbon bond length between those of typical single and double bonds, and partial pyramidalization of the carbon atoms. Insertion of the ester into this intermediate produces metallacycle III, which undergoes β-alkoxide elimination followed by a second insertion event to afford intermediate IV. Displacement of the product by two more equivalents of Grignard reagent restarts the catalytic cycle (Eq. 2). It should be noted that an anionic catalytic cycle involving a series of catalytic ate complexes has been proposed to explain the need for more than two equivalents of Grignard reagent under conditions that employ stoichiometric amounts of titanium. The conversion of I to II may take place through two conceivable mechanisms (Eq. 3): (1) β-hydride elimination followed by reductive elimination of an alkane (pathway A) or (2) direct elimination of alkane without the intermediacy of a titanium hydride (pathway B). These pathways have not yet been distinguished experimentally. A cis relationship between substituents on the 1- and 2-positions of the cyclopropanol product is often observed in these reactions. 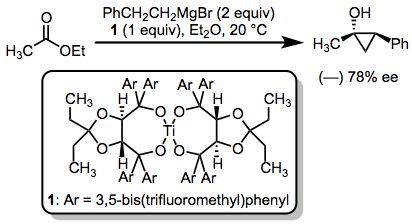 The step that establishes the relative configuration of the product is the second migratory insertion of the carbonyl group into the titanium-carbon bond. Complex VIa leads to the observed major cis diastereomer and is more favorable than the diastereomeric VIb due to unfavorable steric interactions between R and Ti(OY)3 in the latter (Eq. 4). When R1 is bulky, the trans isomer is favored. Enantioselective versions of the Kulinkovich reaction are rare, and enantioselectivities are moderate. In one example, the use of a full equivalent of TADDOLate complex 1 provided chiral cyclopropanols in up to 78% ee (Eq. 5). A wide variety of esters may be cyclopropananted using the Kulinkovich reaction. Despite the possibility of olefin exchange with the titanacyclopropane intermediate (see Eq. 7 below), distal olefins are generally well tolerated under the reaction conditions (Eq. 6). The use of bulky Grignard reagents can lower the yields of Kulinkovich reactions. 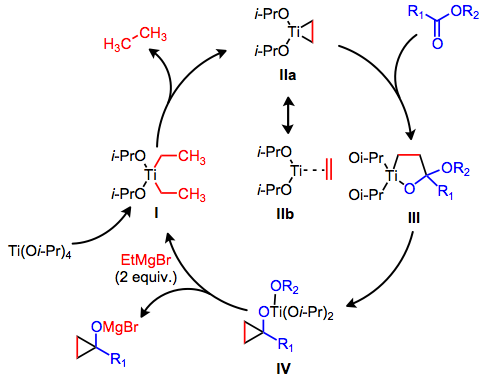 This drawback seems to limit the scope of the reaction significantly; however, it is possible for the intermediate titanacycle II to exchange with a more substituted olefin to afford more highly substituted cyclopropanols in high yield (Eq. 7). The olefin exchange procedure is not generally useful when monosubstituted olefins are employed, unless more substituted Grignard reagents such as cyclohexylmagnesium chloride are used as starting materials. Formation of the more stable monosubstituted titanancyclopropane from the disubstituted intermediate derived from cyclohexylmagnesium chloride drives the formation of the less substituted product (Eq. 8). The use of methyl titanium(IV) isopropoxide 2 can be useful when the Grignard reagent starting material is precious. Although 2 is prepared from methylmagnesium bromide, only one equivalent of Grignard reagent is needed for the Kulinkovich reaction because methane evolves as the reaction proceeds (Eq. 9). Contrary to the typical cis diastereoselectivity of the reaction, homoallylic alcohols may be cyclopropanated to afford trans-1,2-dialkylcyclopropanols. Significant 1,3-stereocontrol is also observed when chiral homoallylic alcohols are employed (Eq. 10). The Kulinkovich reaction may be employed for cyclopropanation of a variety of carboxylic acid derivatives. For instance, amides may be cyclopropanated to afford cyclopropylamines in high yield and diastereoselectivity (Eq. 11). The trans-1,2-dialkylcyclopropanol is favored under these conditions. This result is a consequence of inversion of configuration at the carbon bound to titanium in the second migratory insertion step when amides are employed (contrast with Eq. 4 above). Cyclopropanation of carbonates provides access to synthetically useful cyclopropanone hemiacetals (Eq. 12). The bonds between the hydroxyl-bearing carbon of a cyclopropanol and the other ring carbons are susceptible to cleavage in the presence of electrophiles or acids. This mode of reactivity has made cyclopropanols synthetically useful; for instance, they may serve as homoenolate equivalents in the presence of an electrophile. When the electrophile is part of the cyclopropanol, ring expansion may result (Eq. 13). The results of reactions of this type are often sensitive to the nature of the electrophile and other reagents employed. Cyclopropylamines are similarly useful as cyclopropanes activated by an electron-donating group. They may serve as iminium ion equivalents in the presence of a nucleophile. For example, the final step in Eq. 14 is a masked Pictet-Spengler reaction between an iminium ion formed in situ and the electron-rich arene. Several methods exist for the synthesis of cyclopropanols. The presence of an alcohol in the target means that ketones may be used as electrophiles for intramolecular ring closing to form cyclopropanols. For example, samarium-mediated reductive ring closure provides cyclopropanols in high yield (Eq. 15). The insertion of metal carbenoids into electron-rich pi bonds is another method useful for the construction of the cyclopropanol skeleton. When Fischer carbenes are used, the reaction proceeds through a chair-like transition state (Eq. 16). Oxaspiropentanes (themselves prepared from cyclopropylidene sulfur ylides) may also be used to synthesize cyclopropanols. They are particularly useful for the synthesis of alkenyl cyclopropanols, which can be difficult to synthesize through Kulinkovich reactions of α,β-unsaturated esters (Eq. 17). Kulinkovich reactions are typically carried out under an atmosphere of nitrogen or argon. The use of a syringe pump is advised when slow addition of the Grignard reagent is required. To a 500-mL, round-bottomed flask, equipped with a magnetic stirring bar and rubber septum, is added at room temperature a mixture of 2.0 g (15.6 mmol) of methyl 5-hexenoate, 11.2 mL (11.2 mmol) of a 1 M solution of chlorotitanium triisopropoxide in hexane, and 54 mL of anhydrous ether under a nitrogen atmosphere. A 1 M solution of n-butylmagnesium chloride in ether (52 mL, 52 mmol) is added over a period of 6.5 h via a syringe pump at room temperature. After the addition is complete, the resulting black reaction mixture is stirred for an additional 20 min. The mixture is cooled to 0 °C with an ice bath, diluted with 50 mL of ether and then quenched by slow addition of water (14 mL). The resulting mixture is stirred for an additional 3 h at room temperature. The organic phase is separated and the aqueous phase is extracted with ether (3 × 100 mL). The combined organic extracts are washed with brine (2 × 50 mL), dried over anhydrous magnesium sulfate, filtered, and concentrated under reduced pressure using a rotary evaporator. Purification of the crude product by column chromatography on 40 g of silica gel using a gradient of 5% to 10% ether/pentane as the eluent provides 1.09 g (71%) of the product shown as a colorless oil. bp 53-55 °C (15 mm, Kugelrohr); IR (neat) cm−1: 3300; 1H NMR (360 MHz, acetone-d6) δ 0.47 (t, J = 4.6, 1 H), 0.67 (dd, J = 4.6, 8.9, 1 H), 1.02-1.15 (m, 2 H), 1.43 (dd, J = 7.9, 12.1, 1 H), 1.55 (m, 1 H), 1.75-1.89 (m, 3 H), 4.25 (s, 1 H, -OH); 13C NMR (90 MHz, acetone-d6) δ 14.9, 21.8, 24.3, 27.4, 34.3, 64.2; Mass spectrum: m/z 98 (M+, 29), 97 (47), 83 (56), 70 (100), 55 (54). ↑ Kulinkovich, O. G.; Sviridov, S. V.; Vasilevskii, D. A.; Pritytskaya, T. S. Zh. Org. Khim. 1989, 25, 2244. ↑ a b Kulinkovich, O. G.; Savchenko, A. I.; Sviridov, S. V.; Vasilevskii, D. A. J. Chem. Soc., Mendeleev Commun. 1993, 230. ↑ Cohen, S. A.; Auburn, P. R.; Bercaw, J. E. J. Am. Chem. Soc. 1983, 105, 1136. ↑ Kulinkovich, O. G.; Kananovich, D. G. Eur. J. Org. Chem. 2007, 2121. ↑ Eisch, J. J.; Adeosun, A. A.; Dutta, S.; Fregene, P. O. Eur. J. Org. Chem. 2005, 2657. ↑ Casey, C. P.; Strotman, N. A. J. Am. Chem. Soc. 2004, 126, 1699. ↑ Corey, E. J.; Rao, S. A.; Noe, M. C. J. Am. Chem. Soc. 1994, 116, 9345. ↑ Dolgopalets, V. I.; Volkov, S. M.; Kisel, M. A.; Kozhevko, A. N.; Kulinkovich, O. G. Zh. Org. Khim. 1999, 35, 1469; Russ. J. Org. Chem. 1999, 35, 1436. ↑ Lee, J.; Kim, H.; Cha, J. K. J. Am. Chem. Soc. 1996, 118, 4198. ↑ Savchenko, A. I. Ph.D. Dissertation, Belarusian State University, Minsk, 1995. ↑ Quan, L. G.; Kim, S.-H.; Lee, J. C.; Cha, J. K. Angew. Chem., Int. Ed. 2002, 41, 2160. ↑ Lee, J.; Cha, J. K. J. Org. Chem. 1997, 62, 1584. ↑ Lee, J.; Kim, Y. G.; Bae, J. G.; Cha, J. K. J. Org. Chem. 1996, 61, 4878. ↑ Carey, J. T.; Knors, C.; Helquist, P. J. Am. Chem. Soc. 1986, 108, 8313. ↑ Larquetoux, L.; Ouhamou, N.; Chiaroni, A.; Six, Y. Eur. J. Org. Chem. 2005, 4654. ↑ Fukuzawa, S.; Furuya, H.; Tsuchimoto, T. Tetrahedron 1996, 52, 1953. ↑ Toratsu, C.; Fujii, T.; Suzuki, T.; Takai, K. Angew. Chem., Int. Ed. 2000, 39, 2725. ↑ Trost, B. M.; Bogdanowicz, M. J. J. Am. Chem. Soc. 1973, 95, 5311. ↑ Kim, S.-H.; Sung, M. J.; Cha, J. K. Org. Synth. 2003, 80, 111.